It can be embarrassing when you’re at a celebration for someone’s birthday when you have to refuse a slice of cake because you have a wheat or dairy intolerance. That happened to me twice this week. Luckily I met Sarah Jones who runs Especially Delicious http://www.especiallydelicious.co.uk/ a gluten free bakery and was able to make me a wheat and dairy free cake for my last birthday. Sarah asks you what special interests you have and incorporates them on the cake. Thus I had a fountain pen made of icing (to depict the writing), ‘la, la la’ to represent the choir I sing with and a silhouette of a woman doing Pilates exercises! All very clever – but what was wonderful is that Ray and I could eat the cake! And we’ve frozen what was left, which we serve to friends as and when. 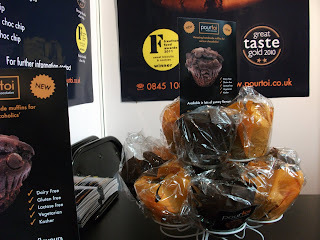 Visited Caffe Culture this week and it was good to see Pourtoi Artisan Chocolatier http://www.pourtoi.co.uk/, winner of the Sweet Biscuits Category of this year’s Free From Awards http://www.freefromawards.co.uk/ for its Raisin Double Choc Chip Cookie, which is gluten free, dairy free, wheat free and lactose free. What’s more, the company received three Gold Awards from the Guild of Fine Food’s Great Taste Awards last year for two other varieties of cookie. 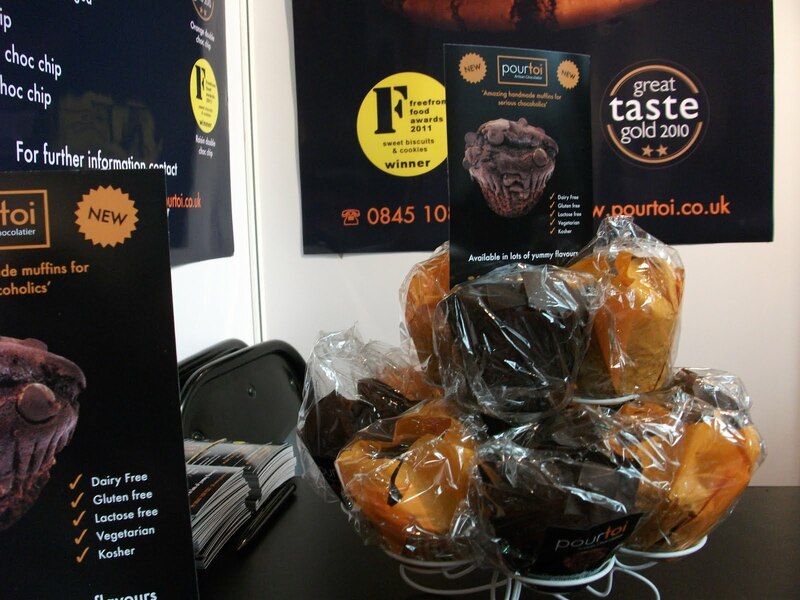 I tasted their new gluten and dairy free muffins – banana double choc chunk and orange double choc chunk, all beautifully moist with a strong chocolate flavour. Claire Rose started up a chocolate company with her husband Ian. A family member was a coeliac and so they decided to explore gluten free options. “The market has grown,” says Claire. “The focus of our company is to create products which are treated as a mainstream product, suitable for everyone.” Miraculously, at the show, I found a wheat-free sandwich at the Crussh Juice Bar http://www.crussh.com/ at London’s Olympia exhibition centre. Normally at these events I go hungry or take my own, but not this time! It was made from wheat free bread, avocado, spinach, crunchy peppers, beansprouts, hummus, sun-dried tomatoes. Delicious! On Thursday I met Sally-Jayne and Corinne for lunch at Lola Rojo Spanish restaurant and deli, 78 Northcote Road, Clapham Junction http://www.lolarojo.net/ We had the lunch special – three tapas $8.50. There was plenty of choice for wheat free options – my favourite was crispy aubergine with blossom honey. Other choices included Serrano ham, cod gratin and Spanish omelette. Don’t know how Ray would have fared here.Meanwhile, Ray had lunch at Pizza Express in Kennington (316 Kennington Road, SE11 4LD) http://www.pizzaexpress.com/. “They were very helpful,” he said. “They assured me there was no milk in the dough. I ordered a Venezia pizza with very little tomato, no mozzarella and extra anchovies.” On the web site if you click on “allergies” there is a chart giving details on each menu item as to whether it contains gluten, dairy, nuts and so on and whether it would be suitable for a coeliac or vegan. If only more restaurants did this you could go to the restaurant knowing which dishes you can order. And so to Friday and the judging of the Great Taste Awards – what fun! The Great Taste Awards, organised by the Guild of Fine Food http://www.finefoodworld.co.uk/. This year there were 7,432 products entered with a panel of 300 judges. Our job is to advise how the product could be improved, to be positive at the outset and be encouraging. It was an illuminating morning. We blindtasted everything from salami, lamb, dark chocolate, jams, marinades and ice cream. You’ll have to wait until the results are announced in July to see who won.